In her freewheeling new play “King of the Yees,” author Lauren Yee quickly busts through the figurative “fourth wall” between audience and actors. A frisky character named Larry Yee hands out bottles of water to thirsty front-row patrons. He also aggressively, humorously canvasses the ACT Theatre audience for members of the Chinese-American clan he is devoted to, as the head (and maybe the last surviving member?) of the Yee Fung Toy Family Association of San Francisco. 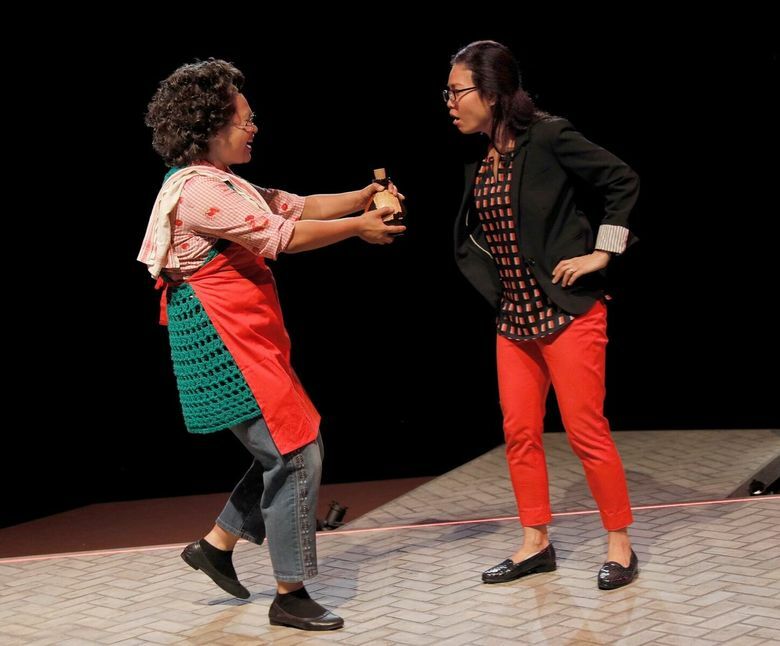 This is not the only illusion-breaking the playwright Yee employs in her heartfelt and messy, captivating and confusing father-daughter tale. You see, that gregarious guy with the water is named and modeled after her own dad. And she is clearly the basis for his adult daughter Lauren Yee, a 30-year-old disentangling her feelings about him and an Asian legacy she, like many assimilated millennials, finds “obsolescent” and irrelevant. Yee often keeps us guessing in the meta-theatrical “King of the Yees,” which provides as many theatrical gimmicks as it does insights. It opens with a mini play-within-a-play about, well, a father (played by Ray Tagavilla) obsessed with his family heritage, and a dismissive daughter (Annelih GH Hamilton). But these are actors playing actors, and soon are supplanted by other actors playing the “real” Yee relations: the endearingly eccentric postal worker Larry (wonderful Stan Egi), and the exasperated, Yale-educated Lauren (a forceful Khanh Doan), who views her father’s all-male club, once a major force in Chinatown, as the relic of an archaic system of misogynistic, feudal power-brokering. And just when one craves some narrative direction, a mystery arises. Larry suddenly vanishes, and Lauren’s frantic search for him leads to an adult rite-of-passage: appreciating your parent’s humanity, and realizing they are mortal. As in earlier Yee works (“Ching Chong Chinaman,” “in a word”), this writer displays a distinctive, keen-edged wit, a quirky and capacious imagination and a fresh, millennial vision of Asian America. Desdemona Chiang’s direction is crisp, with some savvy visual and audio effects. And the actors (also including Joseph Ngo) are snappy, invested and, in some instances, expert shape-shifters. They have to be adept, especially when the play lurches and confuses. Like, where are we now? And why is Lauren rehearsing a play in San Francisco, while briefly there to (we learn eventually) celebrate her father’s 60th birthday? Tidiness of plot is not always a theatrical virtue, but neither is a loosey-goosey narrative. “King of the Yees” is most engaging at its most cogent and least didactic. And bending the rules of dramatic realism is most deftly accomplished here in Lauren’s fantastical yet coherent search for Larry. It leads her into fairy-tale encounters with Chinatown cultural icons: a sinuous dragon puppet she dances with; batches of fortune cookies dropped from heaven; and elder oracles in Portsmouth Square, reminding her how much one generation needs another. Information in this article, originally published Sept. 15, 2017, was corrected Sept. 16, 2017. A previous version of this story mistitled a play by Lauren Yee. Her play is “Ching Chong Chinaman,” not “The Chickencoop Chinaman” by Frank Chin.